The original Greased Lightning formula is time-tested for superior cleaning and stain-fighting power. 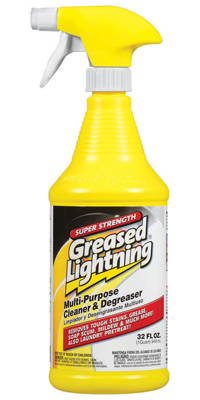 Greased Lightning conquers the toughest stains and can be used throughout the home. Cut through grime on stove vents, ovens and microwaves. Remove red wine, pet stains and dirt from everyday traffic on carpets. Use as a laundry pretreat for tough stains including grease, grass and ink. Tackle soap scum and mildew stains in the shower. Revitalize patio furniture by removing dirt and outdoor debris. My favorite thing about this cleaning product is that I can use it on almost everything. I spent some time going around my house the other day and cleaning random things. I used Greased Lightning on some old carpet stains, the counters, the glass table, the outside of the fridge and dishwasher and garbage can, and to clean my bathroom sinks. I love being able to clean so many things without switching products. And the Greased Lightning worked really well on everything. I was particularly happy with how well it worked on the carpet stains- got the stains out without discoloration of my carpet. The only thing that I didn't like about Greased Lightning is that it is not a "natural" product, and I've been trying to use more of those in my home, since I do have little people around, and since our home is small, it's hard to get away from cleaning fumes. Still, I will continue to use Greased Lightning on my dirty surfaces when it's possible to have my windows open and/or ventilation fan on to deal with the fumes, since it's a really useful product. And I have good news, one of you will win a coupon good for a free bottle of Greased Lightning! Open to US mailing addresses only, enter at the Rafflecopter widget below. Disclosure: I received a bottle of Greased Lightning to try for myself, as well as a coupon to give away to one of you. I was not compensated in any other way and all opinions posted here are mine and mine alone. I need to clean all the doors in my home! I need to clean the fan above my oven and my countertops. My microwave could use a good scrubbing too! What do I not need to clean is the better question! I've been using degreaser for years now and it never disappointed me. It's difficult to remove greases on the carpet and clothes but degresers made it easy to do. I always have stocks of degreaser in the house.